As the people of Surigao recover from the devastation wrought by the 6.7 magnitude earthquake that struck Surigao Province last Friday, the Coca-Cola System offered quick and ready assistance to the families. At least 11 towns including the provincial capital and two major bridges essential were damaged. The earthquake and its aftershocks have left an estimated ₱601.8 million in damage in its wake. In light of this, the beverage company immediately arranged to send aid in the form of a vital resource–safe and clean drinking water. 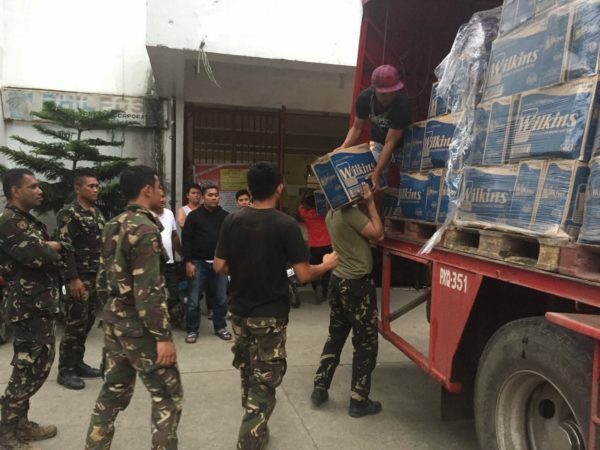 On February 11 – the day after the quake, 100,000 worth of Wilkins Distilled water were unloaded at Surigao City Hall. The drinking water was distributed through the efforts of the local government, with the assistance of Coca-Cola FEMSA Philippines pre-sellers, 301B personnel of the Philippine Army, and the Department of Social Welfare and Development. In addition to the products, Coca-Cola Philippines, Coca-Cola FEMSA Philippines, and the Coca-Cola Foundation are working with the local government of Surigao for the deployment of the SETA Potable Water Machine – a mobile drinking water facility with the capability to treat and produce 3000 l/h of potable drinking water a day – to sustainably ease the community’s need for this resource, and will continue to support the rehabilitation efforts in the province.